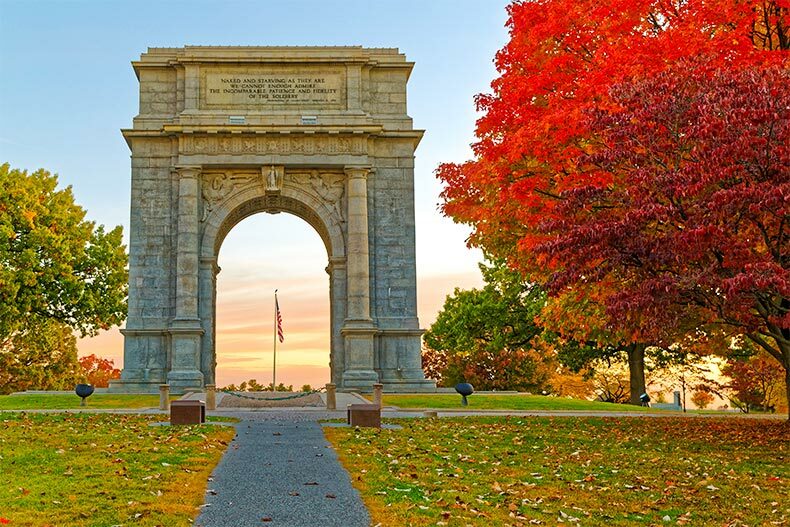 Homeowners in these Royersford 55+ communities are always close to history in Valley Forge National Park. Royersford, Pennsylvania is a genteel township in Montgomery County that is bordered on the west by the Schuylkill River. It's just 10 miles south of Pottstown and 32 miles north of Philadelphia, and is easy to get to via U.S. Route 422. Royersford's roots were formed back in 1879 when it was a farming community. Royersford has since grown into an appealing suburb with a blend of the old and new. There are historic homes dating back to the 18th century in town, a trendy main street, other shopping centers, and amazing golf courses. Active adults that are interested in Royersford, PA real estate will want to know that the surrounding towns of Spring City, Upper Providence Township, and Limerick are all part of this general region. Some residents living in Royersford actually have mailing addresses in some of these other towns. Popular parks in Royersford include Chestnut Street and Victory Park. Victory is the larger of the two, it hosts special activities like yard sales, holiday events, and monthly concerts. Valley Forge Historical Park is also about 10 miles away. The Montgomery County-Norristown Public Library sponsors free events, like knitting classes, mahjong, and yoga. There are four small and mid-sized 55+ neighborhoods here, with different personalities, home choices, and amenities. Read on to see which one is best for you and your family. Ridgewood broke ground in 2006, and will have 356 attached new and resale homes when completed. It started out as a 55+ community, but now welcomes home buyers of all ages. Ridgewood does not have a clubhouse, but it is minutes away from the Upper Providence Recreation Center, which offers fitness classes, hobby groups, and bus trips. The nearby Spring Ford Country Club in Royersford is an exclusive, member-owned facility that also offers outstanding golf, plus swimming and a restaurant. Minutes from the community is Landis Creek Golf Club and Turtle Creek Golf Course, the latter of which received four-and-a-half stars from Golf Digest. Other local attractions include Friends Meeting House, Black Rock Dam, and Far Away Farm. Three of Ridgewood’s five models feature first-floor master suites, and the other two have elevator options. The floor plans range from 1,990 to 2,400 square feet with two to three bedrooms, two-and-a-half to four-and-a-half baths, and attached one or two-car garages. Options include decks, porches, and lofts. Built next to Linfield National Golf Club, The Villas at Lindfield is a newer community with 200 attached homes. It is within walking distance of the riverfront, and close to Main Street, which crosses right over the river into Chester County. Being so close to the main thoroughfare is quite convenient, with all of the restaurants and shops a stone’s throw away. The Villas is also less than five miles from Pottstown Hospital, which has many top doctors on staff. The ranch-style villas here come in two models, either 2,200 or 2,341 square feet with two bedrooms, two or three bathrooms, and attached two-car garages. These homes feature first-floor master suites, covered patios, finished lofts, and open floor plans. The private clubhouse has an outdoor pool that is flanked by a lovely terrace and veranda. There are also tennis courts and walking & biking trails. Inside, there is a business center, and exercise room, a billiards room, a bar, catering kitchen, and a grand ballroom. Popular social groups include the garden committee, ladies’ coffee, fundraising events, and yard sales. William Penn Villas is an intimate 55+ community of 87 attached and single-family homes. It offers its residents a peaceful setting just down the road from Limerick Community Park. This 70-acre facility has a walking track with fitness stations, and a cute playground for the grandkids. William Penn Villas is also close to several golf courses, beauty salons, restaurants, and grocery stores. The Philadelphia Premium Outlets and a Costco are also just three miles away from this community. Floor plans range from 1,194 to 2,995 square feet with two to four bedrooms, two to three bathrooms, and attached one or two-car garages. The community clubhouse has activity rooms for residents to use, and there are walking and biking trails on the property. Residents gather together for card games, coffee, the book club, and happy hours. Village of Willow Run is an established, affordable active adult community right in between Limerick Community Park, Turtle Creek Golf Club, and Landis Golf Club. Homeowners enjoy its quiet setting along with the benefits of being close to West Ridge Pike, where there are numerous banks, salons, restaurants, gas stations, and everything else they need. Some of the popular landmarks nearby include the upscale King of Prussia Mall, Elmwood Zoo, and Hopewell Furnace, a fascinating early American industrial site that operated from 1771 to 1883. Village of Willow Run has 150 single-family homes, ranging from approximately 1,100 to 1,900 square feet. They have two or three bedrooms, two to three bathrooms, and attached one or two-car garages. There is a community clubhouse with an outdoor pool and an exercise room.